The hash would not work without your help. The instructions laid out below are guidelines, but this is your run. If you want to do a themed run or have drink stops then speak to one of the committee and we'll do all we can to help. There are no rules, so if you want to change something, be my guest; just remember we're a mixed bunch, so try and consider everyone if possible. Not have a problem with us making noise during down downs. Be reasonably near to the tube. Pubs expected to provide down down beer and sometimes even free food, so make sure you speak to the manager in advance and face to face. Sell them on the benefits of having 40-60 drinkers on a quiet Tuesday night and see how much you can get out of them; having the hash can increase their take by £300-700 per night, so 8 free pints is nothing in comparison. To use some sales talk - aim for the stars and you will hit the moon, if you confidently let the pub know we normally get food and drink from other pubs, they'll be far more likely to give it to us. The main aim of the hash is for everyone to start and finish together, having run as far and as fast as they want. To do this you therefore have to either slow down the FRBs (Front Running Bastards) with loops, false trails, checks and beer stops or speed up the SCBs (Short Cutting Bastards) with short cuts and re-markings (see below for example). A general rule the more you piss off the fast runners, the better the run and they secretly love it. We have set up a hash account on www.mapmyrun.com so you can see previous hashes set and get an idea of what they look like. 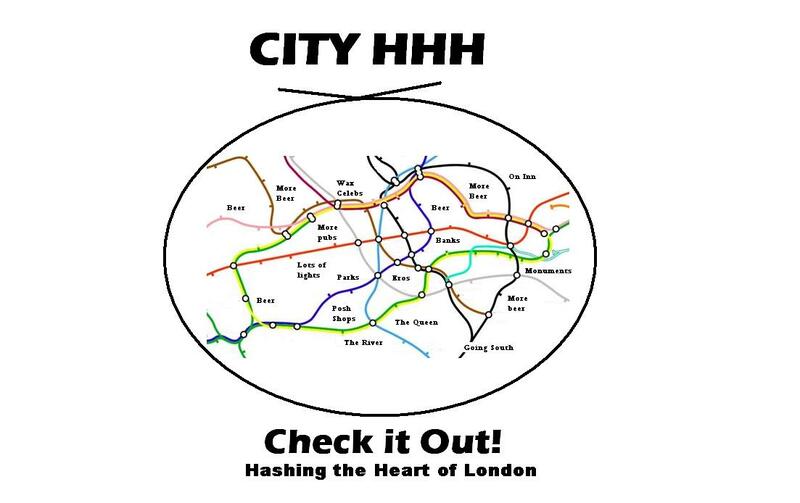 Username: cityhasher, Password: chalk (no capitals). The City pack views 45-60 minutes as standard. As a rule of thumb, it should take 2-2.5 hours to walk the trail at a reasonable pace. Less than that and the run will be too short, more and it will probably be too long. If you look for the inner loop to be around 4.5 miles you won't go far wrong. Remember the fastest runners can run anything up to 8 miles, where as the slowest 3-4, the more loops, false trails and checks that send the FRBs the wrong way, the more likely the run are going to stick together. www.mapmyrun.com can help with this. Every Hare MUST recce the trail in its entirety at least once. You might think you know the area well and Google maps gives you good coverage, but without recceing there are likely to be roadworks/hidden alleyways/road closures which could result in you laying the trail into dead ends or the pack running into other parts of the run. Hares MUST NOT set their trails on bicycles. The trail-markings always end up too far apart, leading to "lost trails" and the hare often misses out on the best back-routes and alleyways; there's nothing like a good back passage! Parks often close early in the winter, so check times on the entrances before laying the trail. Most people lay around 8 checks, they are best deployed at the edges of your runs. False trails (FT or two long lines across the pavement) should be used if there is a danger of people discovering another part of the trail. Regroups are sometimes used by hares to bring the group back together, but unless there is a specific reason to do so (beer stop etc.) you should try and avoid them; they stop people who want to run from running and in bad weather, it can become extremely cold or wet. If you think it is likely the pack will split, then try and lay more loops, false trails or shortcuts. And if you can try to never be too far away from the pub at any time, it allows the slower runners or people injured/lost to head back if they want to. Locate some chalk or drywall (gyprock) from your neighbourhood skip or ask someone on the Hash for it. You must NOT lay the trail in flour! Depending on how understanding your boss is, it is best to set the run during the day several hours before the start of the run. If it is set the day before check the run on the day of the run (especially if it has rained since you set it). Setting a clear P trail from the tube station to the pub is as important as a good trail. Remember you're laying the trail for 7pm Tuesday night, so make sure the markings are in places less likely to be trampled on or washed away and visible in darkness if applicable. Be aware that people run on both sides of the road. You don't need to lay it on both, but if you have a route that requires runners to go a certain way you may need to mark changes in direction on both sides. (c) the meeting point should be mid-trail and not at a check (unless there's a really obvious physical barrier to prevent the pack getting confused e.g. a river or railway line). The very last part of the run is the On-Inn. When you've brought everyone around and the final last bit of the way back is readily apparent, simply write ON INN on the ground and be done with it. Hares SHOULD have spare chalk/plasterboard to give to FRBs so that checks get marked through. Hares MUST mark the out-trail from the pub clearly so that late-comers can find the Start, of the run easily. During the run, the Hare and the Co-hare should make sure the runners are on trail. Depending on the hares, it is best to have one towards the middle / front of the pack and one towards the back of the pack. If only one hare is going out, it is best that they stay towards the middle / back of the pack. Encourage runners to call or use the horns and check out routes where necessary. Mark all checks through for any latecomers trying to catch up and lay extra markings where deviations are possible. The Hare and co-hare should remain at the finish until all runners have returned. If any runners have not returned within a reasonable amount of time, say 1 and a half hours from the Start of the run, then the Hare and co-hare with the help of available members should organise search parties since they know the area and the way round the trail. Fortunately this is rarely required. The hares should coordinate with the Beer Wench and RA the beers for the down downs.